Find five of these rare flowers for the alchemist Aurane Frernis. Travel to Ald Sotha to collect five rare Roland's Tears. Return to Aurane to receive a potion of Luck. Once you've completed the leaflets quest for the alchemist Aurane Frernis, who has a store in the Lower Waistworks level of Vivec's Foreign Quarter, she will ask you to travel to the nearby Daedric shrine of Ald Sotha to collect five rare Roland's Tears. The flowers are identical in appearance to the common Gold Kanet, a dark yellow flower with small, rounded petals (so you'll need to activate the plant and hover over or select the contents to determine if it's a normal Gold Kanet plant or a Roland's Tear variety). The shrine is northeast of Vivec and abounds with Gold Kanet, though the Roland's Tears are more difficult to find. In particular, the Tears grow towards the east side of the ruin, though there are several others scattered about as well. 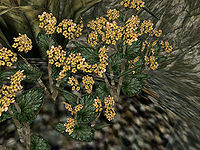 Seven flowers are obtainable from a clump growing beneath a tree directly east of the entrance to the shrine—there are four plants, one of which provides three flowers, and one flower lying on the ground between the plants. Return to Frernis with five Roland's Tears to receive a reward of a potion of Luck. 1 Aurane Frernis needs me to find a rare gold kanet plant called Roland's Tear. 5 I've agreed to find the gold kanet plant called Roland's Tear. One variation of this plant is said to have wondrous powers when combined with other ingredients. She said she would make me something extra-special and rare if I bring her five flowers from this plant. 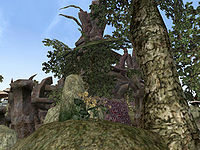 Aurane Frernis believes it can be found at the eastern edge of the ruins of Ald Sotha, to the east of Vivec. 10 After some searching, I found the plant she was looking for. 100 Finishes quest When I returned with the plant, Aurane Frernis made me a potion of luck. This page was last modified on 23 February 2019, at 20:56.